Restore discoloured grout to a bright white finish. Covers up to approx 20m2 of tiles. Contains mould shield to restrict discolouration from bacteria, mildew and mould. 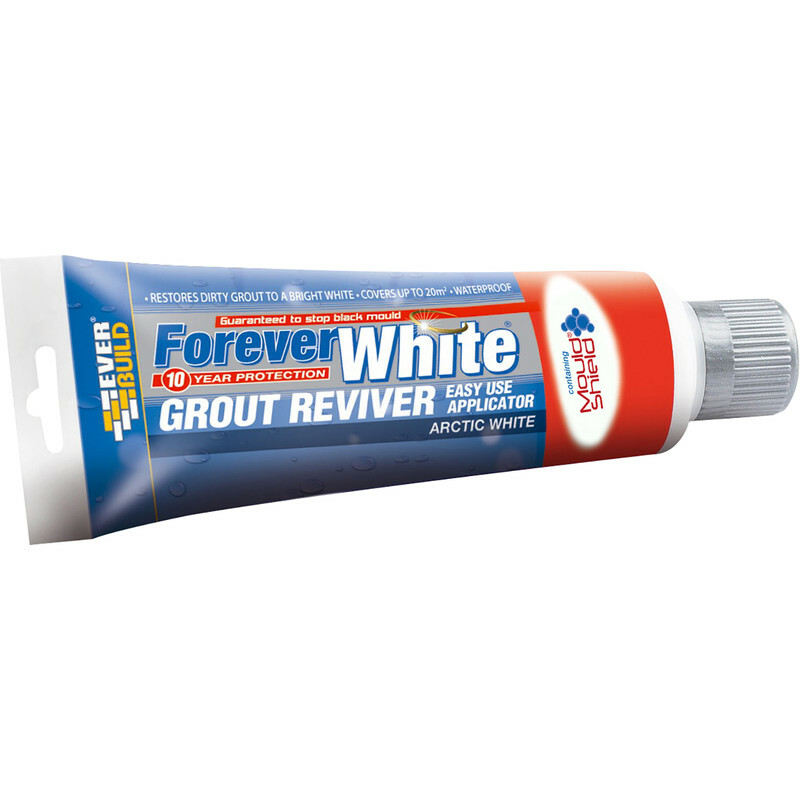 Forever White Grout Reviver 200ml Arctic White is rated 4.8 out of 5 by 56. Rated 5 out of 5 by WarrenB from Great product at a great price Bought this for a try as very cheap. As others have said sponge comes off however I just squirted a little on the sponge and continued and to be honest better as can get right into the grout lines. 1 tube done a standard flat bathroom which was tiled ceiling to floor and now looks all fresh. Took me around 3 hours to do bathroom. Rated 5 out of 5 by Leedsdad from Near perfect I have used a number of tubes of this product over the years and it never fails to impress how easy it is to use when new and what a great finish it produces without needed to remove all of the old grout. However, like other reviewers I did start my review by stating when new. The design problem is the sponge applicator. I think I managed to carefully apply the reviver to about 1m2 of tiling before the sponge fell off, as it has with all other tubes I have bought. It’s so obvious it will fail that with just a rethink the company could have a faultless product. I would be happy to pay more if the applicator was more durable. I did use the detached sponge, but it is difficult to use with gloves on and the reviver is harsh on the hands. May I add their sanitary sealant is the best silicon I have ever used. It is much easier to work than other silicon sealants as it can be wiped away easily whilst still wet from hands and other non porous surfaces with a dry tissue. It also resists mould fo very long periods. Rated 5 out of 5 by YorkieSparky from Superb idea If this product lasts as long as it says then this is worth every penny. Shame the sponge does come off the tube but I used it in my fingers just as easily. Should have done this years ago as the result looks like the bathroom has just been tiled! Rated 5 out of 5 by Hutchy438 from Wow ! Good stuff !! I thought I was going to have to re grout the whole shower ! Read the reviews on this and bought some . Easy to use and makes the grout look like new . What could have taken me days was done in 1 hour with the same effect and no mess . Rated 5 out of 5 by Paul747 from Brilliant! (Literally) I’ve tried others, but this is by far the best. Much easier to apply than the pens and lasts longer.